The Pioneer Park Memorial is located within Pioneer Park in Colorado Springs. From Interstate 25, take the Fillmore exit, go west for 1.5 miles; turn south on Panorama Drive, then turn east on Cenotaph Circle and drive 1 1/2 blocks. The park is located on the south side of the street. According to GPS-derived geolocation (accurate to within 10 meters), the memorial's coordinates are latitude 38°51'58.1"N and longitude 104°51'34.4"W. This well-maintained park has a wonderful view of Pikes Peak. This monument to early pioneers was dedicated September 20, 1949, by the El Paso County Pioneer Association. In previous years, the cemetery (then part of Colorado City) was known as Mesa Cemetery; a Masonic cemetery (El Paso Lodge No. 13) was nearby. Some of the burials were moved to Evergreen and other cemeteries after the cemetery was abandoned in the early 1900s. In the 1930s a WPA project "temporarily" removed the remaining tombstones, but they were never returned. According to the Colorado Springs Gazette Telegraph (January 13, 1977), tests showed the presence of perhaps more than 100 coffins under the park. Etched at the top of the memorial is a covered wagon pulled by two oxen with the dates 1858-1903. 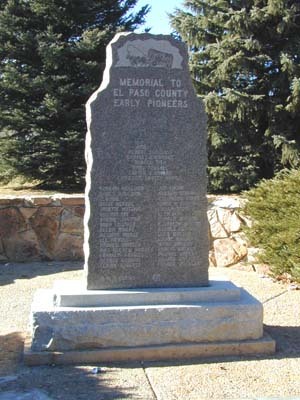 Below the wagon is the inscription "Memorial to El Paso County Early Pioneers." The Colorado Springs Pioneers Museum supplied the additional information on the pioneers listed on the memorial. Information attributed to Taylor is from Mesa Cemetery by James Taylor (Colorado Springs: Park and Recreation Department, 1963), and information attributed to Nolan is from a typed list titled "Mesa Cemetery Burials" produced by Joe Nolan and available at the Pioneers Museum. A 1939 WPA project to identify veterans' graves found eight veterans of the Sand Creek massacre in Mesa Cemetery (Taylor, 28), but they weren't named. Andrew FISH: Taylor (p. 24) lists middle initial L.
Jacob GILL, who died July 13, 1871.